First: It's been three years since Prime Minister David Cameron's first visit to China, a not inconsiderable period of time in international relations, particularly between such significant trading partners. To what extent do you feel that mechanisms for bilateral relations need to be improved in order to guarantee closer high-level contact between the two countries? 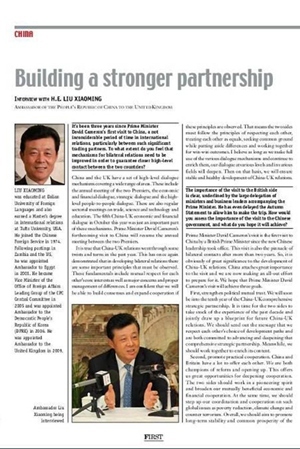 Ambassador Liu: China and the UK have a set of high-level dialogue mechanisms covering a wide range of areas. These include the annual meeting of the two Premiers, the economic and financial dialogue, strategic dialogue and the highlevel people-to-people dialogue. There are also regular sectorial meetings on trade, science and technology and education. The fifth China-UK economic and financial dialogue in October this year was just an important part of these mechanisms. Prime Minister David Cameron's forthcoming visit to China will resume the annual meeting between the two Premiers. It is true that China-UK relations went through some twists and turns in the past year. This has once again demonstrated that in developing bilateral relations there are some important principles that must be observed. These fundamentals include mutual respect for each other's core interests as well as major concerns and proper management of differences. I am confident that we will be able to build consensus and expand cooperation if these principles are observed. That means the two sides must follow the principles of respecting each other, treating each other as equals, seeking common ground while putting aside differences and working together for win-win outcomes. I believe as long as we make full use of the various dialogue mechanisms and continue to enrich them, our dialogue at various levels and in various fields will deepen. Then on that basis, we will ensure stable and healthy development of China-UK relations. First: The importance of the visit to the British side is clear, underlined by the large delegation of ministers and business leaders accompanying the Prime Minister. He has even delayed the Autumn Statement to allow him to make the trip. How would you assess the importance of the visit to the Chinese government, and what do you hope it will achieve? Ambassador Liu: Prime Minister David Cameron's visit is the first visit to China by a British Prime Minister since the new Chinese leadership took office. This visit is also the pinnacle of bilateral contacts after more than two years. So, it is obviously of great significance to the development of China-UK relations. China attaches great importance to the visit and we are now making an all-out effort to prepare for it. We hope that Prime Minister David Cameron's visit will achieve three goals. First, strengthen political mutual trust. 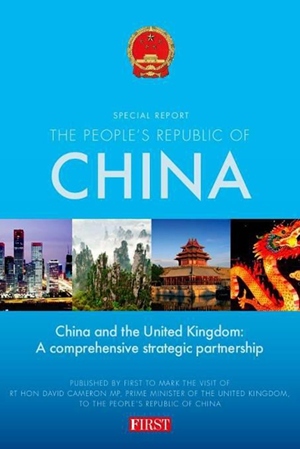 We will soon be into the tenth year of the China-UK comprehensive strategic partnership. It is time for the two sides to take stock of the experience of the past decade and jointly draw up a blueprint for future China-UK relations. We should send out the message that we respect each other's choice of development paths and are both committed to advancing and deepening that comprehensive strategic partnership. Meanwhile, we should work together to enrich its content. Second, promote practical cooperation. China and Britain have a lot to offer each other. We are both champions of reform and opening up. This offers us great opportunities for deepening cooperation. The two sides should work in a pioneering spirit and broaden our mutually beneficial economic and financial cooperation. At the same time, we should step up our coordination and cooperation on such global issues as poverty reduction, climate change and counter terrorism. Overall, we should aim to promote long-term stability and common prosperity of the international community. Third, increase mutual understanding. China and UK differ considerably in history, culture, development stage and social system. A better understanding of each other's national and social conditions is the foundation for the sound development of bilateral relations. Our two countries should expand exchanges in education, culture, science and tourism. This will help our peoples gain better knowledge about each other's country in modern times, and form new 'view of China' and 'view of Britain'. Better understanding and closer friendship will in turn guarantee our bilateral relationship solid support from the general public. First: How would you assess the current state of the Sino-British bilateral relationship in all its forms – political/diplomatic, trade and investment, cultural and educational links – and what are the Chinese government's priorities regarding its relationship with the United Kingdom? Ambassador Liu: China and the UK are currently engaged in active exchanges and cooperation at various levels and in various fields. China is Britain's second-largest trading partner outside the EU. In a stark contrast with other EU countries, Britain's trade with China has continued to grow. Our two-way investment has kept expanding. Chinese investments in Britain in the past 18 months surpassed the total amount over the previous three decades. Offshore RMB business in London is thriving. Sixty-two per cent of RMB settlement, excluding China's mainland and the Hong Kong SAR, is done here in London. Among all European countries, Britain is the largest recipient of Chinese students. Britain also leads Europe in numbers of Confucius Institutes and Confucius Classrooms. Our two countries also have close communication and coordination on many major international issues. Both China and the UK are big countries of global influence. We both carry great weight politically, economically and culturally. Our relations are alldimensional. China stands ready to further advance the comprehensive strategic partnership with the UK and, through joint efforts, achieve new progress in our mutually beneficial cooperation on all fronts. First: Do you see the dynamic of the two countries' economic relationship changing, as China focuses more on boosting domestic demand and the UK seeks to boost its own export performance? Ambassador Liu: Recent years have seen rapid growth of British exports to China. Records show that British exports to China surged from US$7.9 billion in 2009 to US$16.8 billion in 2012. This is an annual increase of 29 per cent and means it took only three years to double exports. China has become one of Britain's fastest-growing export markets. In the same period, the annual increase of Chinese exports to Britain only stood at 14 per cent. In China-UK trade, China does not aim at a trade surplus. We have always encouraged more British exports to China. This policy will remain unchanged in the foreseeable future. The report of the 18th Congress of the Communist Party of China (CPC) stated that China would put equal emphasis on imports and exports and promote balanced growth of foreign trade. This forecasts rapid growth of China's imports in the future. The recent Third Plenum of the CPC Central Committee set out a masterplan on comprehensively deepening reform in China. As China's reform deepens, the forces of the Chinese market will be further unleashed. The business environment will be fairer and more open. This will create greater opportunities for British exporters. We welcome British companies to more actively explore the Chinese market, sell products that meet Chinese market demand and contribute to balanced and healthy growth of China-UK trade. First: How would you describe the public perception of China in the UK and vice versa? What more can, and should, be done to improve mutual understanding between our two peoples, in your view? Ambassador Liu: Friendship between peoples lies at the heart of relations between countries. Friendship between peoples depends heavily on mutual understanding. Mutual understanding and friendship between Chinese and British people are the very foundation of China-UK relations. China and the UK both have a proud history; each can take pride in the contributions their civilisations have made to advance all humanity. Our peoples have long been keen to understand each other and their efforts to this end have never ceased. Today, there is much exertion by both peoples trying to advance their perception of one another and so deepen understanding of each other. In the eyes of the Chinese people, Britain is as traditional and reserved as it is innovative and energetic. Chinese people are fascinated not only by British history as well as classical literature and painting, but also the modern delights of fashion, football, high-tech and James Bond. In the eyes of British people, China is no longer mysterious and opaque. Instead, they see China as a modern and dynamic country. The rising fascination about China in Britain reflects not only the immense interest in the Chinese language and traditional Chinese culture, but also China's stunning economic success, enormous leaps in science and innovation as well as huge business opportunities. Of course, we are aware that due to differences in history, culture and values, there is much room for improvement in our understanding and knowledge of each other. In recent years, China-UK links have enjoyed great advancements in education, culture, science and technology, sports and youth. We should seize opportunities and deepen cooperation. In doing so, our mutual understanding will be much improved and bonds of friendship greatly strengthened. First: China's recently-concluded Third Plenum has attracted a great deal of coverage in the UK media, particularly on the subject of financial reform and the 'unleashing' of market forces to play a 'decisive' role in the economy. What do you regard as the most significant outcomes, and what are the main implications for international investors in China? Ambassador Liu: Let me answer the first part of your question with one word: 'reform'. Reform is the key to all the successes China has made over the past 35 years. The Third Plenum marked a new beginning of China's reform agenda as it has set out sweeping measures on deepening reform, and shows to the world China's resolve to push for reform. China will be committed to across-theboard reform in the six areas of economic, political, social, cultural and environmental progress as well as Party building. A key area among all these is economic reform. The kernel of this issue is to have a proper relationship between the government and the market. Such a relationship should allow the market to play a decisive role in allocating resources, yet at the same time enable the government to play a more effective supervisory role. While strengthening top-down design, the Third Plenum has specified more than 300 measures to achieve 55 major reform tasks in 15 sectors. Many measures have attracted great attention in the British media. For example, opening the financial sector wider to domestic and foreign investors, moving faster towards a market based interest rate regime, and making the renminbi convertible under capital account. The Third Plenum has also put in place a roadmap and a timetable to guide the reform process. That is, we must achieve conclusive results in key areas by 2020. On the second part of the question, my answer is: deeper reforms in China will bring enormous opportunities to foreign investors, UK investors included. Opportunities will emerge in three areas. First, greater market access. The Third Plenum has set out clear tasks. These aim to formulate fair, open and transparent market rules; adopt a uniform market access regime; experiment with a pre-establishment national treatment and negative list approach towards foreign investment; increase access for foreign investment; harmonise laws and regulations governing both domestic and foreign investments; open up the financial, educational, cultural and healthcare sectors; relax restrictions on foreign investment in such services sectors as construction, accounting, auditing, logistics and e-commerce and further open up in an orderly manner the manufacturing sector. All these will allow greater market access for foreign investors. Second, a better investment environment. The Third Plenum has targeted to build a modern and open market economy, as well as strengthening the rule of law. This means that China will provide a more level playing field. There will be a further opening up of the services sector, a streamlining of the procedures for foreign investment, stricter enforcement of IP protection and a more predictable legal environment. In a word, these reform measures will create a better investment environment for foreign investors. Third, more investment opportunities. As China shifts its growth model at a faster pace, the Chinese market will greatly expand. This will be driven by promoting urbanisation; improving old-age support; reforming medical and health care; drawing on the best achievements of foreign cultures; importing foreign talents, technologies and expertise. As the market potential is further unleashed, it will offer immense openings for foreign investors. It will also greatly boost China's exchanges and cooperation with Britain and other countries in wide-ranging areas such as the economy, trade, finance, culture and many other fields. Meanwhile, it is estimated that in the next five years, China will invest an additional US$500 billion in other countries, import over US$10 trillion of products and send 400 million tourists abroad. With deeper reform, China will create more jobs and prosperity for all other countries and make a greater contribution to world peace, development, cooperation and common progress. Founded in 1984, First Magazine is published for the world's leadership community and addresses strategic issues of concern to senior international businessmen and government official.